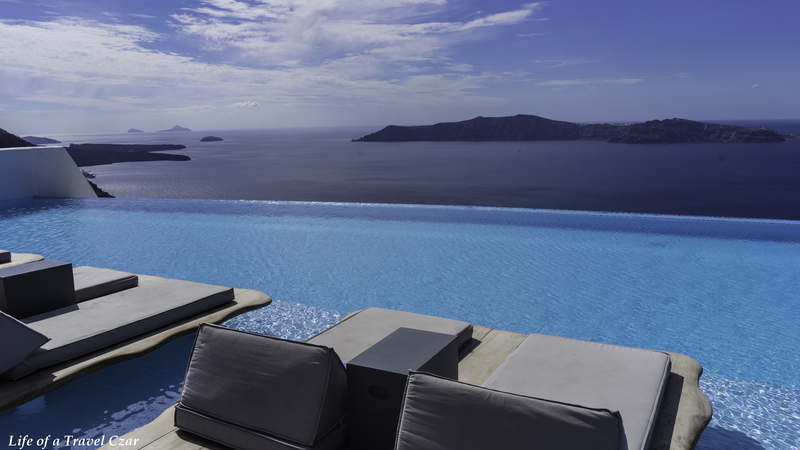 Cavo Tagoo is a lovely hotel in Imergovgli which has stunning views over the Caldera and a lovely infinity pool. The hotel also has a world-class gourmet restaurant, OVAC, which is beside the pool and offers spectacular views with fine cuisine to match. The staff are super friendly and find a table for me with a stunning view of the pool. 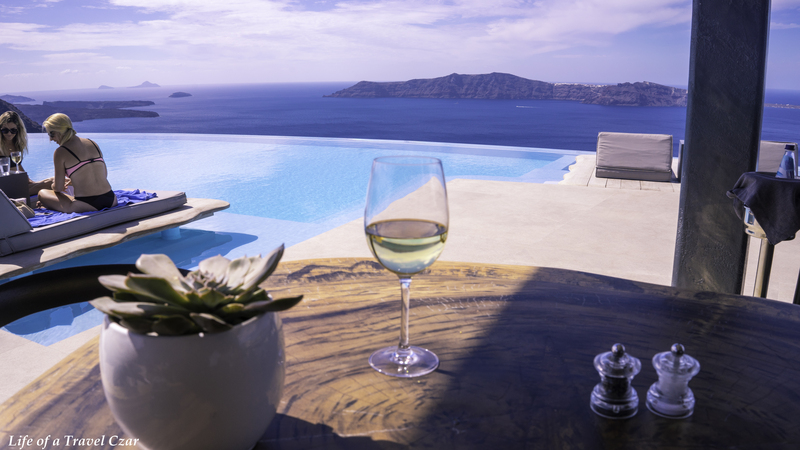 I instantly fall in love the place, the bright aqua colours of the pool, the deep blue Aegean sea, the rocky terrains of the volcano, the chilled vibes and background music – it is a spot of paradise. The whole vibe of the hotel is “look at moi” and I love it. It’s oh so beautiful, words and pictures cannot describe it, so I have made a little video to capture its beauty and the dining experience. The cool background tune is Good Enough by Dodgy – I do not own the rights to the song. 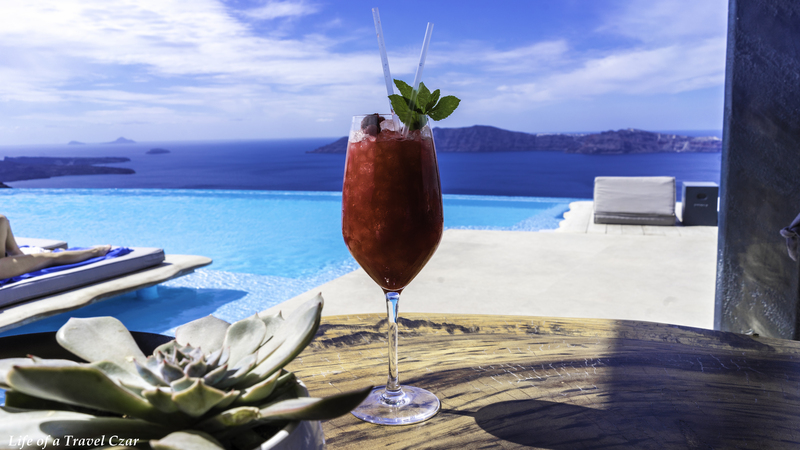 I settle into my seat and peruse the cocktail menu for a refreshing drink to seek refuge from the heat of the Santorini sun. I cast an idyllic gaze across the pool and find a beautiful girl (she must have been fresh of catwalk) sipping on a deep red cocktail on one of the cabanas. I decide her judgement must be sound, so I select the Summer Berry to start. Summer Berry: Vodka Ketel One, Watermelon Juice, Maple Syrup, Blueberries, Marmalade, Fresh Mint Leaves and Lime Juice. 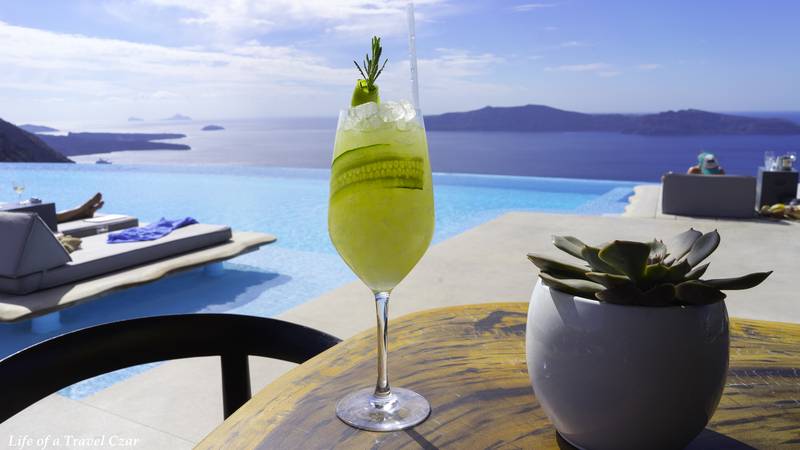 The cocktail has the fresh watermelon hit, the smokiness of maple syrup, the sweet candied intensity of the marmalade which is countered with a precision-like tartness of the lime juice. It would also be remiss of me not to mention the sweet blueberries which lull one into a fall sense that they are being healthy on their holiday. The waiter is so friendly and charming, I certainly love the Greek hospitality and he assists me in my selection of dishes. For the entrée, I opt for the sea urchin. The sweet minerality of the sea urchin, the acidity of the lime and mediterranean rich flourish of the olive oil just “makes” this dish. 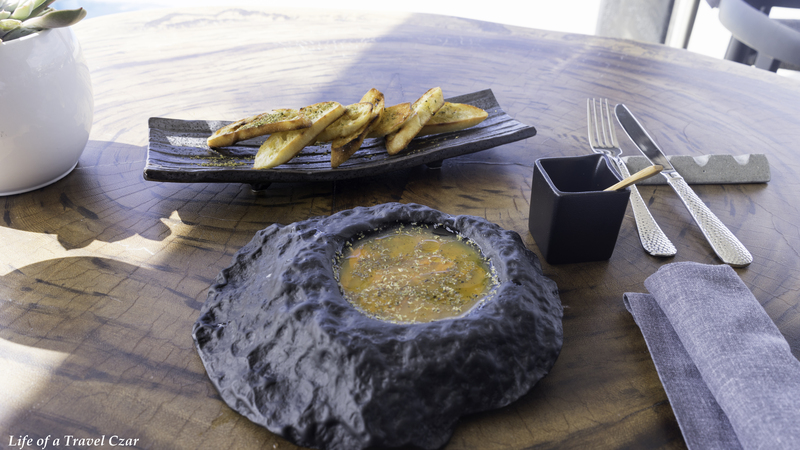 Its simplicity with no interference of stray flavours or textures – it is just amazing. This is a great example of fresh produce standing on its own two feet and I fall in love with a beauty of the sea urchin immediately. There is this super cute spoon which I use to ladle the sea urchin onto the toast as I enjoy the entrée – it is quite an experience. 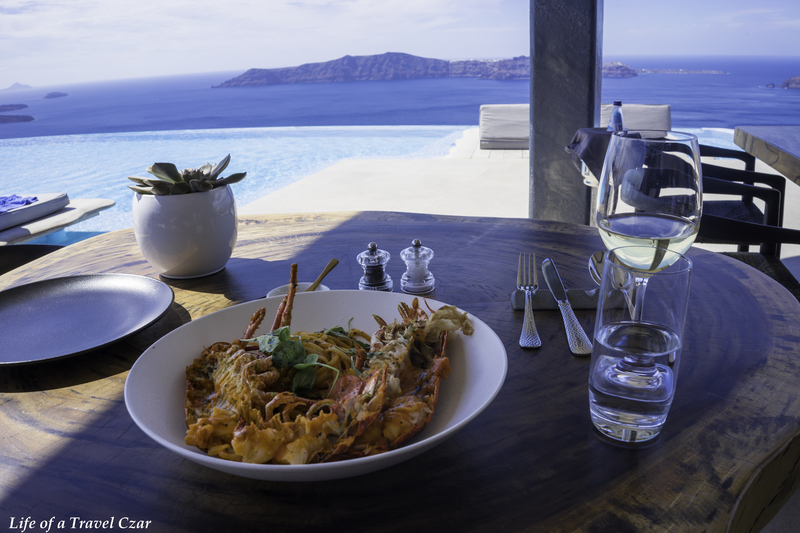 I pair the dish with a Santorini favourite – Sigalas Aa (Assyrtiko 75%, Athiri 25%), 2015. The pairing is perfect; the richness of the sea urchin, the acid bite of both the lemon and the wine is a pure harmony. The wine has beautiful ripe citrus aromas. On the palate, the wine has citrus and some wonderful green apple flavours but that it is the soil that the vines were nurtured in which makes the difference. This wine had exposure to the black lava, volcanic ash and pumice soils, so there this beautiful, incredibly pure minerality and acidity which dominates and drives the taste experience. I choose a lobster for the main course. I have a brief discussion with the waiter on the various preparation methods and decide Pomodoro spaghetti is the go, I select the lobster and we are off. 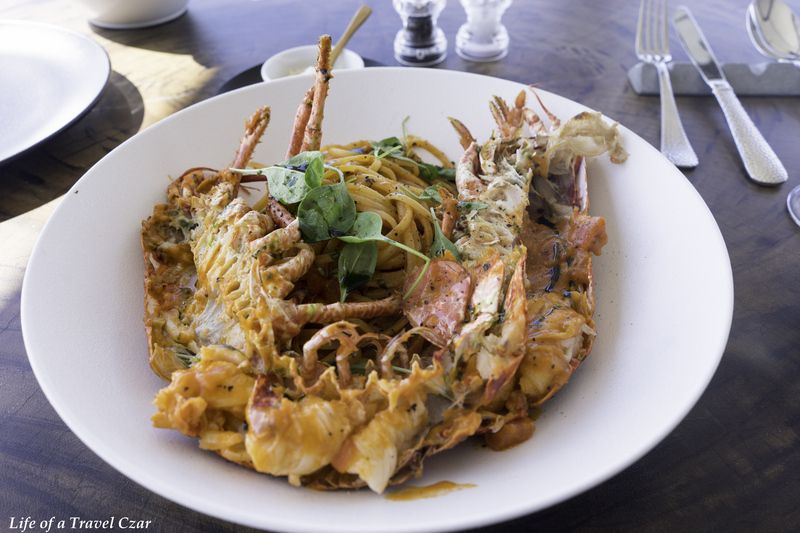 The beautiful juicy tomato and the fresh rich succulent of the lobster prove to be the perfect marriage, while the spaghetti holds them together with its beautiful soft wheaty locks. 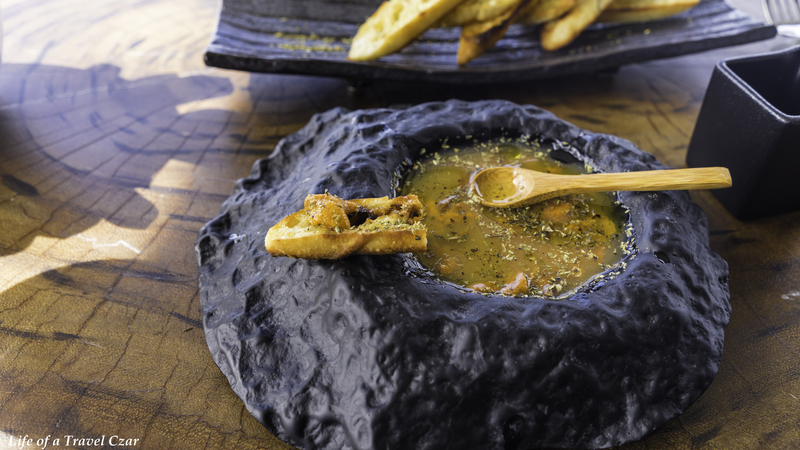 The artistic minerality of the wine makes itself at home with the flavours of the dish. It is a dream. It is quite a sensuous taste experience. 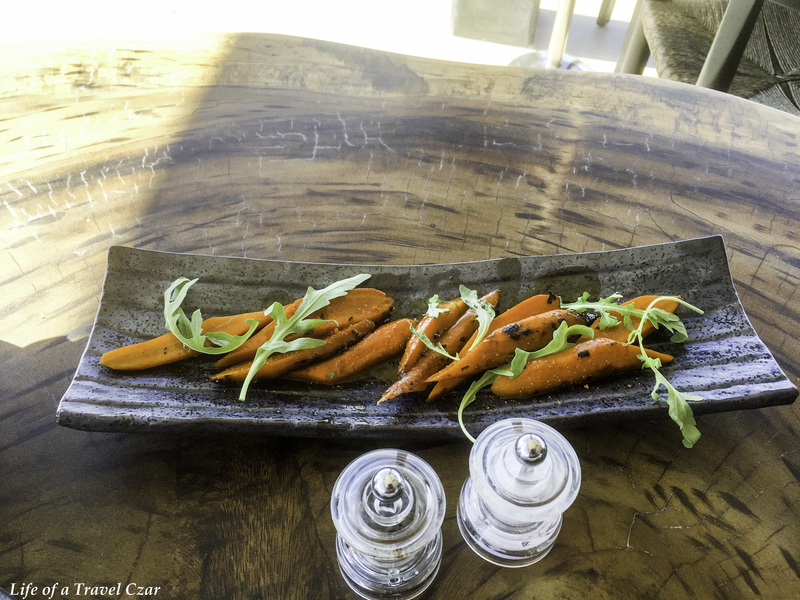 I have some spiced carrots on the side which prove tasty and filling. 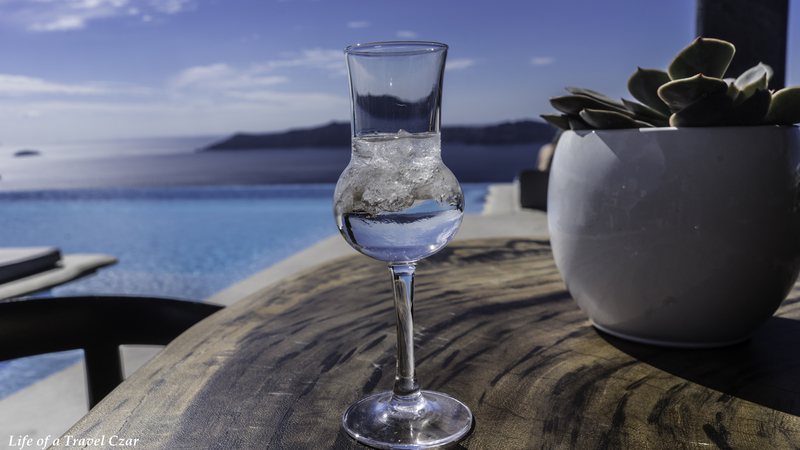 I am provided with a complimentary Santorini Dessert wine which has a beautiful texture and sweet honey like notes which proves refreshing. I decide that I still need another cocktail to sign-off for the afternoon. I initially choose the Summer Berry again, however the waiter cautions me saying “there are so many cocktails on the list, why don’t you do something different” I agree, Life is lived in variety not routine. So I select the Mediterranean Twist. It’s got Gin Mare, fresh ginger, lime juice, simple syrup, lavender oil, water infused with cucumber and bitter lavender. The freshness of the cucumber is marked by a bitterness of the lavender and tartness of the lime and the bite of the ginger. It is a cocktail with good balance and a flourish to match. I gaze at the pool, the sky and the sea just as a breeze descends on the place and strokes my hair, the sun’s reflective glow impresses on the surface of the pool and sea. The gorgeous girls are sipping their cocktails on the edge of the pool, the chilled tunes continue over the speakers and I would love to have stolen and destroyed every clock in the world so I could pause time right now.